This week’s Empowered Woman’s Newsletter is all about beauty. 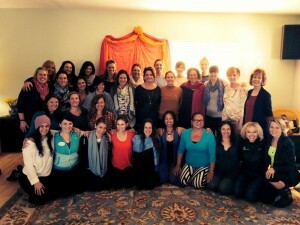 Over the weekend I led my favorite retreat, Celebration of Woman. The title says it all; we celebrated the full range of what it means to be a woman in three and a half days. I’m still riding the high of 19 women coming home to their most empowered, feminine selves. I witnessed moms claim back their joy after years of exhaustion and heartache. I witnessed wise women in their 60s and 70s unleash their beauty and sensuality after decades of lost hope for vitality. I witnessed young women in their 20s remember their perfection and fully own their confidence after years of self-deprecation, unworthiness, and fear. These women walked into the retreat with deep desires to feel happy, loved, and complete. At the end, every single woman was glowing from head to toe, radiating beauty from the inside out. I was so moved by their transformation, that I invited my biological mother to participate in our workshop in October. She said “Yes!” This is a dream come true for me. Stay tuned for that blogpost ;). These women taught me a powerful lesson about what it means to be attractive. An empowered woman is beautiful because she loves herself- all of herself. She loves her body and takes exquisite care of it. She loves her hips, her stomach, her arms, her jiggles, her wrinkles, her moles, and every single “imperfection.” When she loves her body, her body loves her back. Loving her body EXACTLY as it is gives permission for her lovers or partners to love it the same way. When she loves herself, she isn’t afraid to express herself! When a woman is totally authentic and willing to speak her truth, walk her truth, dance her truth, and celebrate her truth- she becomes more attractive by the minute. Loving herself means loving her darkness too. She doesn’t run from her pain, she welcomes it with compassionate honesty. The more compassion she gives herself the more she attracts compassion from others. She plays!! Being playful is an act of self-love. She plays with life from a space of innocence and wonder with zero attachment to the outcome. What makes you, you? How are you beautiful? I have loved hearing from all of the empowered women in this Fearless Purpose community, so please comment below to let me know what makes you stand out in the world. I want to feature your gorgeous voice and wisdom in an upcoming newsletter honoring the empowered women in this group. P.S. Do you want to remember WHO YOU ARE, rather than who others want you to be be? Are you ready to love your body exactly as it is? Do you desire to express yourself fully with grace and confidence? Do you want to own your authentic beauty and attract the partner of your dreams? If you answered yes to any of these questions, fill out this Discovery Form and share what’s stopping you from feeling fully self-expressed and beautiful. We will then set up a FREE 45 min call to design your personal reinvention process. On this complimentary Reinvention call we will map out the changes that must happen to free yourself from fear and self-doubt so you can step into leadership, empowerment, and radical self-love FOR LIFE.